The Angora Club Products Competition is open to all members. 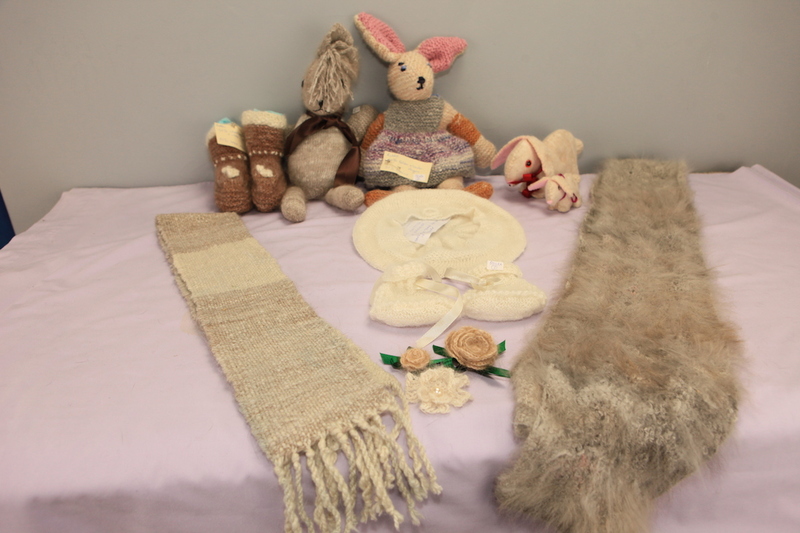 It is not necessary to keep an Angora rabbit to enter yarn, a felted product, garment or accessory, as Angora wool can be obtained from the Club or from another member. Products hand-made from the wool from English, French, German or Satin Angoras and from Angoras of unstandardised colours can be entered. The competitions take place at the Bradford show at Doncaster in January, and the London show at Peterborough in October. Entries can be sent by post. 1) Clipped Wool – White : Sample to be not less than 1/4 oz (7 grams), 2.5ins (6-4cm) minimum staple length required when clipped, excluding the tips. To be presented with fibres parallel, tips together. 2) Clipped Wool – Coloured : As above, colour to be specified. 3) Plucked Wool – White: Sample not be less than 1/4 oz (7 grams), 4ins (10cm) min. staple length required when plucked, excluding the tips. Colour to be specified. To be presented with fibres parallel, tips together. 4) Plucked Wool – Coloured : As above. 5) Satinized Wool – White or Coloured, clipped or plucked. Sample weight and presentation to be as classes 1-4 as appropriate. 6) Yarn. Not less than 1/2 oz (14 grams) skein (hank) tied in 4 places. Ply may include any number of strands. To contain a min. of 25% Angora. Specify technique, yarn composition and colour. 7) Beginner’s Yarn. Entries limited to members with less than 3 yrs spinning experience. To contain a min. of 25% angora. Specify technique, yarn compositions and colours (as above). Suggested entries are hats, gloves, ties, badges, jewellery, pictures, cards, toys etc. Specify techniques and material used and quantity and colour of Angora. Small items may be mounted and displayed on card. Toys must be safe for children to use unless specifically for an adult. Ladies, gentleman’s or child’s garment using one or more techniques. Specify techniques used and composition of garment. To contain a minimum of 25% Angora, eg dyed, felted, hand-sewn, 50% silk, 25% Angora, 25% Wool. 2 complementary items, eg hat and gloves. Minimum 25% angora overall. To contain a 25% angora minimum. 12) Sample Square – A sample square of handspun knitted, woven or crochet fabric to measure 6 ins (15cm) square. To contain a minimum of 25% Angora. 13) Beginners – Entries limited to members with less than 3 years spinning experience. Products from classes 8a, 8b, 9a, 9b, 10a, 10b. 14) Juvenile – A wool sample or an item of any description that must have some angora in its makeup. Posted 07/01/2018 by LH & filed under Wool Products.